Just like you can’t have Halloween without a few skulls, it’s no Día de Muertos without sugar skulls. While the Calaveras are commonly made of sugar or clay, we’ve seen the intricately decorated skulls everywhere during this season. 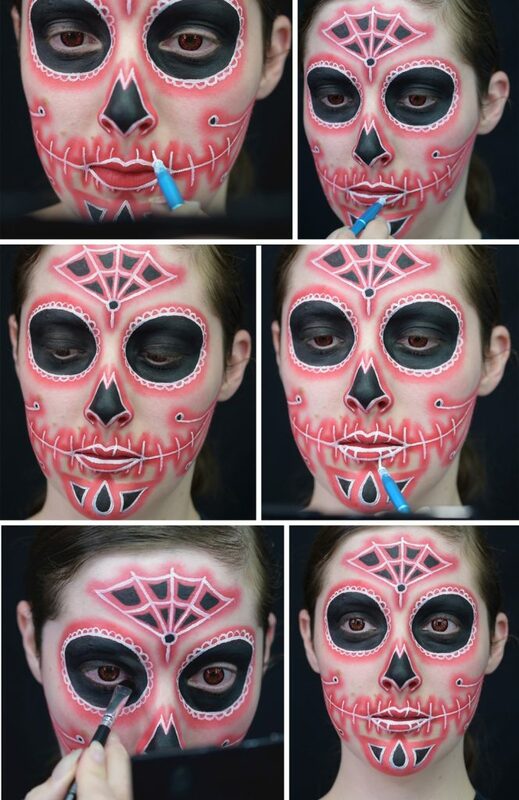 From clothes to tattoos, images of sugar skulls have become so popular. With the Day of the Dead right around the corner, we wanted to find a way to help you celebrate in style. 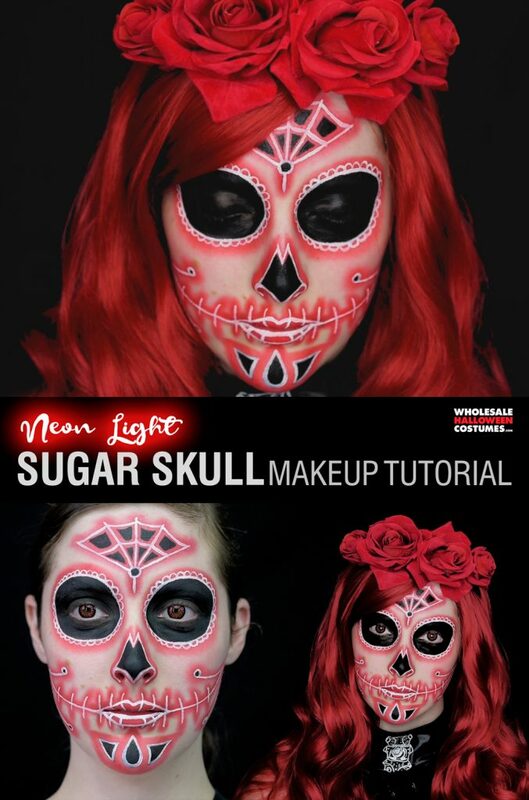 Instead of decorating a skull made of sugar in honor of your lost loved ones, create the work of art on your face! We asked Caitlyn Kreklewich to add a neon twist to the classic sugar skull to top off this festive Day of the Dead dress. If you’re digging this video go subscribe to her channel! Pop in colored contacts if you have them or go to your eye doctor if you want them. We do not recommend buying them online. Use a bright highly pigmented color and lay down the “glow” of the web shape on the forehead. All of the glow should have a very soft edge. Blend all the red lines well. Add the glow of a ring around each eye. Extend the a line from each corner of you mouth back to your ears. Add a three petaled flower to your chin. Add a dot on the middle of your cheek between the eye ring and the mouth line then draw a line connecting it to the end of the line near your ear. Add a dot on the middle of your cheek between the mouth line and your jaw line then draw a line connecting it to the end of the line near your ear. Repeat the dot and line process on the other cheek. 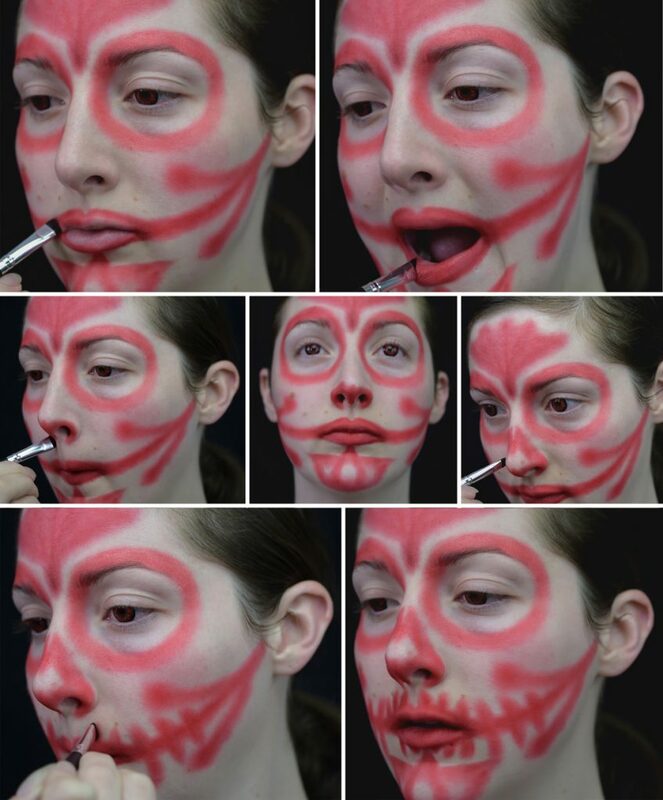 Outline your lips with red and fill them in. Outline the edge of each nostril and fill in the septum. 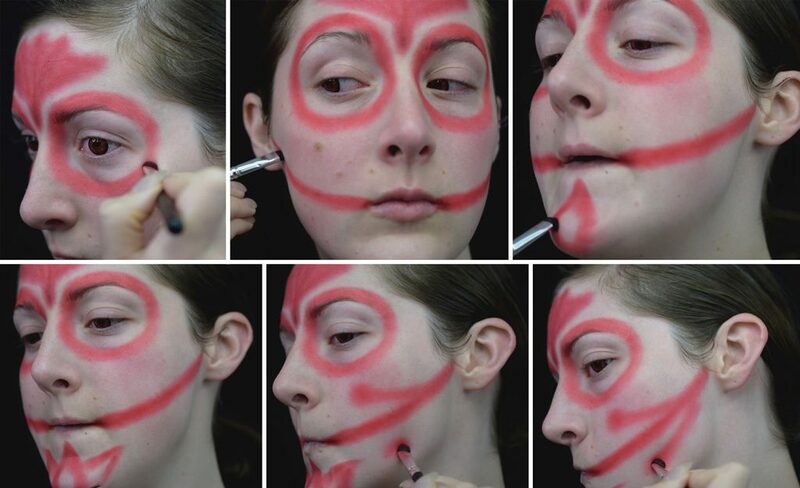 Draw a red line from the side of each nostril to the middle of the bridge of the nose, but don’t connect the line at the very center. Leave a little V of bare skin and connect the line a little lower down. Leave the tip of your nose blank that’ll get filled that in soon. Fill in each eye with black. Use a steady hand to keep the outer edge very crisp. Fill in the tip of the nose with the missing nose shape, like on a skeleton. Also fill in the petals of the flower on the chin. Add a black dot to the the bottom corner of the web on the forehead. 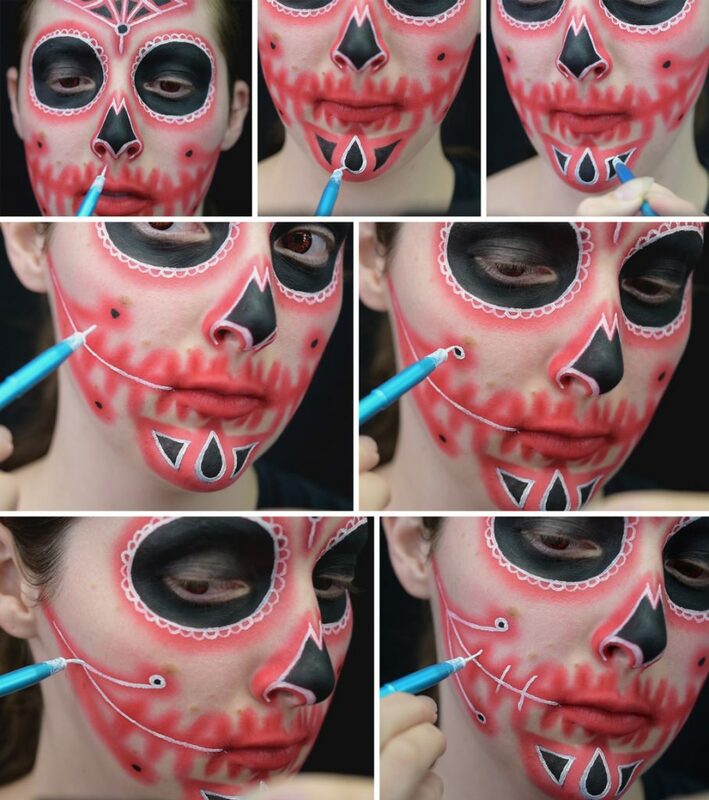 Add similar black dots to the center of the four red dots you added to your cheeks. Fill in the spaces between the web with black using a very thin liner brush. Now time to add a little light. 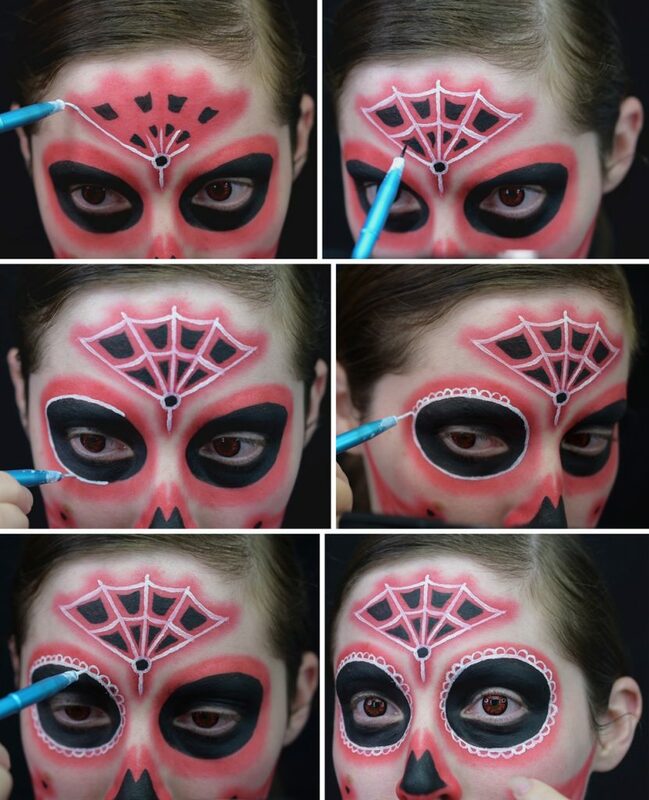 Using the thinnest liner brush you have add white lines to create the spiderweb. Clean up the black shapes between the web if needed. Steady hands are necessary! 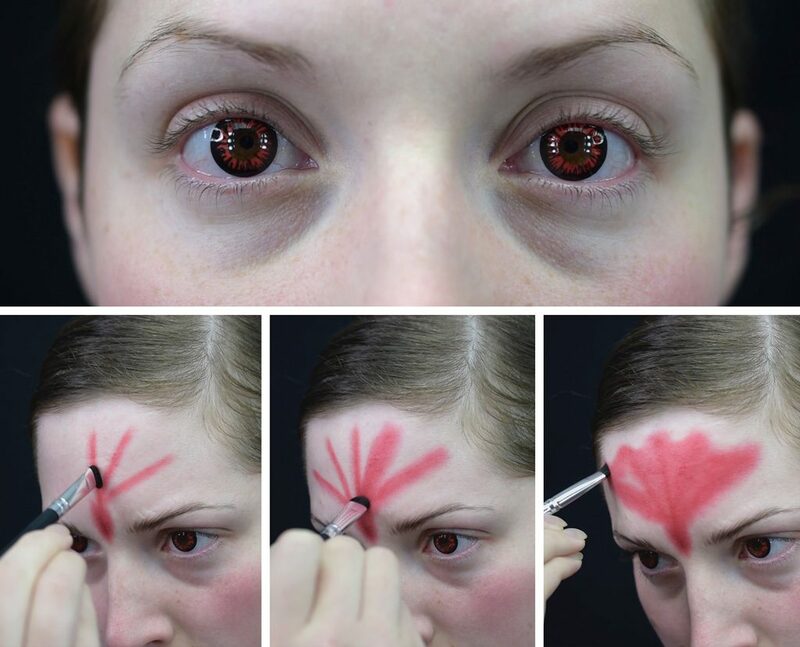 Add a thin white outline to the edge of the black around your eyes. Add a lacy look to the white outlines around your eyes by repeating a pattern of tiny half circles. 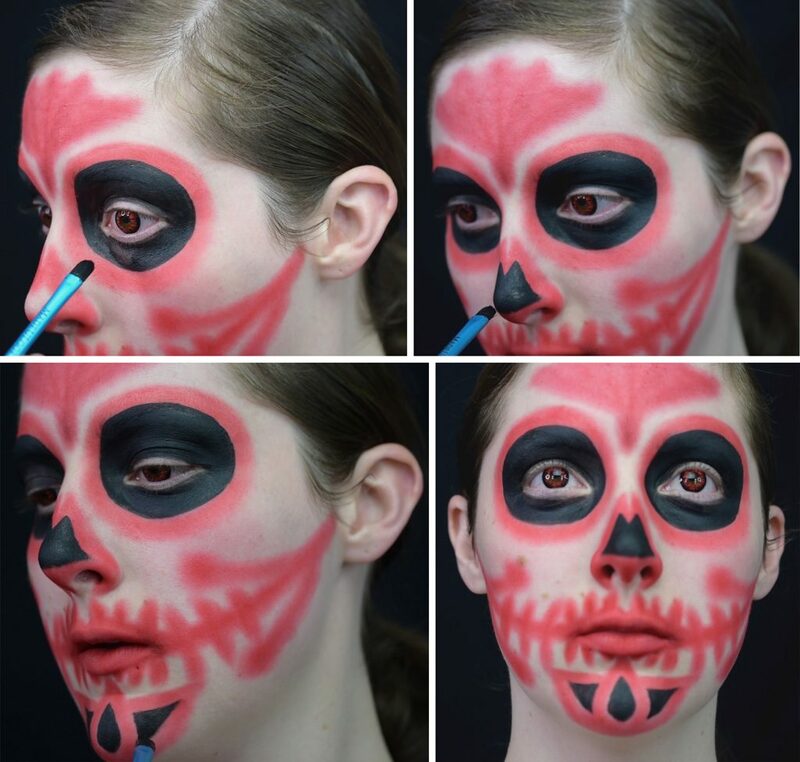 Outline the black shape on your nose and the black petals on your chin with a thin white line. Lay down a thin line right over the center of the red line that extends from each corner of your mouth. Outline the small black dots on your cheeks. Then lay down a thin white line over the lines that extend toward your ears. Now add lines for the “teeth” on the cheeks. Don’t do the teeth around the mouth yet. Outline your lips with a thin white line. Add a thin white line on the inner edge of your lower lip. Add the teeth around the lips. 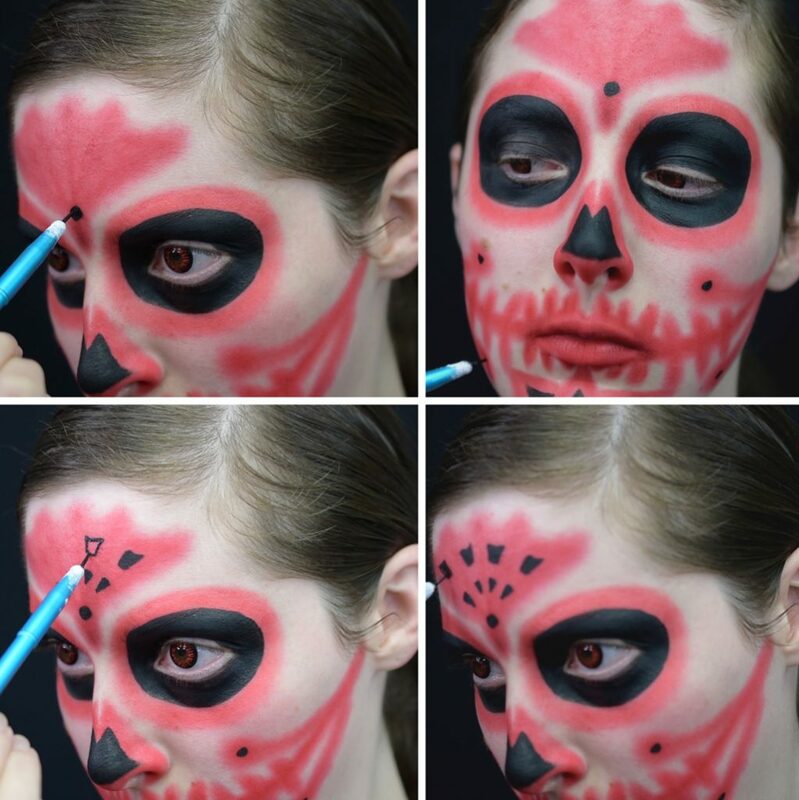 Touch up the black around each eye to make sure the makeup is fully opaque. 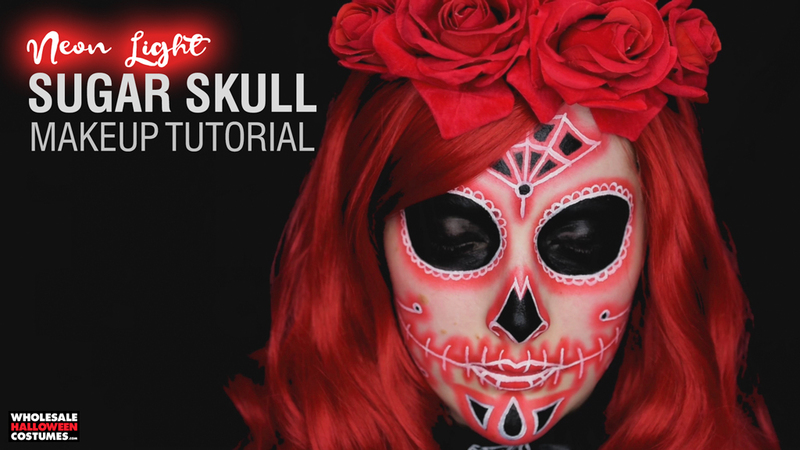 Then throw on your wig and Day of the Dead Dress and show La Catrina your look! 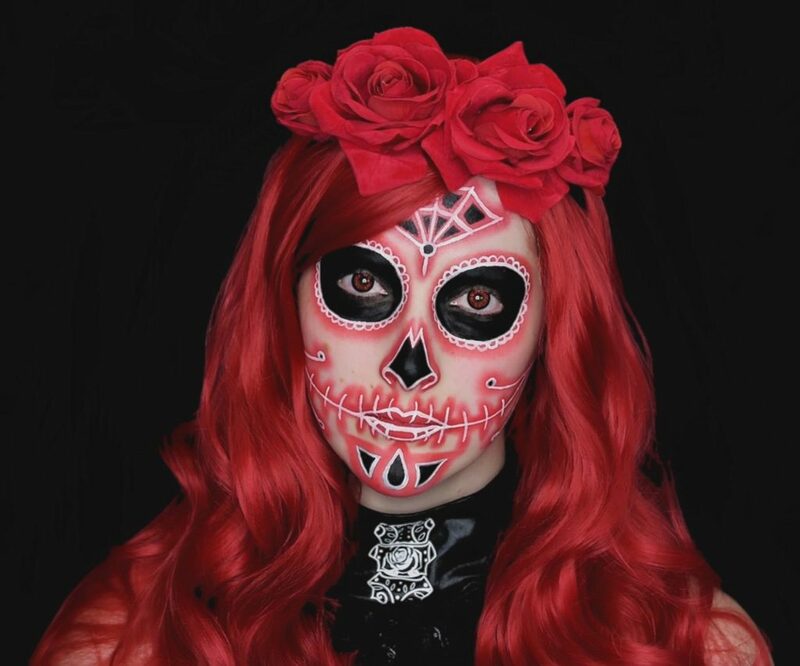 Browse our whole collection of Day of the Dead Costumes for your Day of the Dead festivities or Halloween costume party! Connect with us on Facebook, Twitter, Instagram and Pinterest! Subscribe to our YouTube Channel.